The last time I wore velvet was probably in, like, 5th grade and it was likely in the form of purple track pants or something – yikes. But as a still life photographer now, I really appreciate the richness of the fabric and how beautifully it shoots. I've already totally abused my blue velvet sofa in the sense that it appears in many of my at-home shoots, as a backdrop. And it works so well. With velvet, you have to really know how to light it. In the wrong light, it can be dimensionless and just absorb or reflect all of the light. There's very little I hate more than flat, blah lighting. This mini velvet clutch is from Mary Katrantzou's latest line and can be found on Lyst. It's ridiculously cute (note, it will just barely not fit an iPhone 6+!) and has a removable strap, which is always a nice bonus. 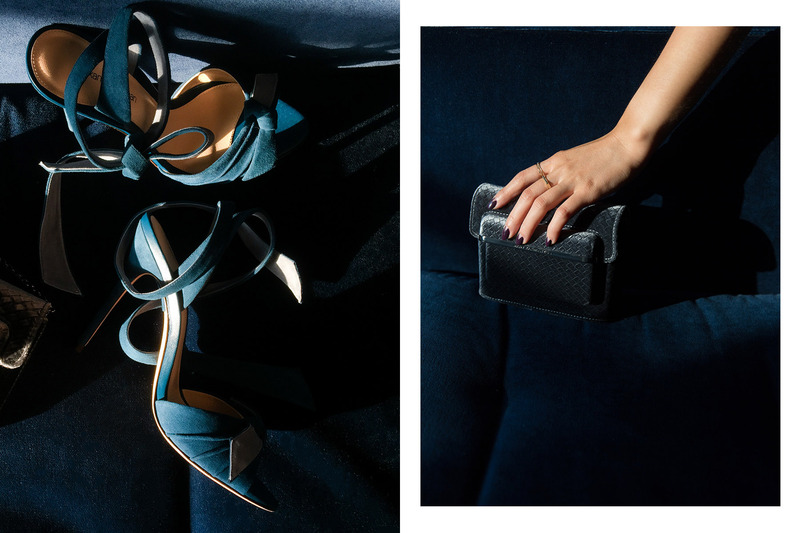 I love shooting accessories these days and I knew it would shoot well in the tiny bit of time my couch gets lit like this (basically between the hours of 6:00 and 6:15pm). It's always hectic when you have just that sliver of time to get your shots. Then the magic is gone. I wanted to highlight a sick (and slick) pair of suede tie-up heels in this lighting too. These have that minimal feel with an extra touch of femininity. 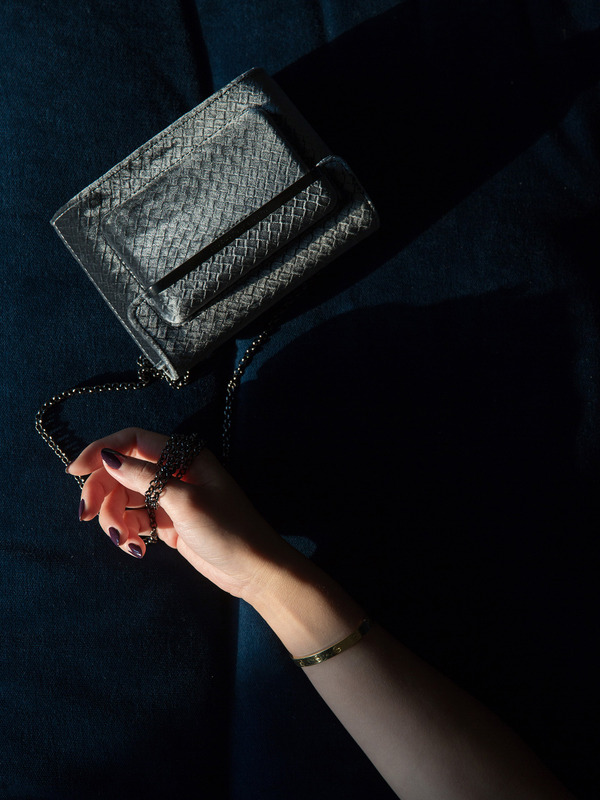 Disclosure: The clutch was a gift from Lyst. See their full line of bags here. The shoes were a gift from Alexandre Birman. Not a diss, but how do you not feel totally pretentious when you write stuff like this? "There's very little I hate more than flat, blah lighting. " I get this is probably hyperbole but still. Hahah no I do feel pretentious but it's also meant in hyperbole. Those shoes are absolutely incredible, the colour + texture is stunning! I love your sofa for sure and your patience for lighting is always well worth those beautiful shots you get. Alice, as always, these are beautiful! If you don't mind me asking, what is your favorite way to market yourself? You post so many beautiful blogs but I'd love to hear more about the "boring" business side of things if you'd ever be willing to write about it! hi alice! where did you get your bracelet? hehe and rings if you dont mind telling us! i just really love the thought that you put into each of your shoot. hehe it's a mix of SLR and iPhone up there. I wish I could say it were all iPhone! love self portrait's dresses!! great job with the lighting. i wish i was home at 6pm to shoot haha!! Great bag, sandals.. and that baby blue laced dress too! click and find best tips for car polish.